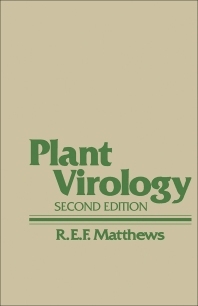 Plant Virology, Second Edition, was written to cover the substantial developments in many areas of plant virology since the first edition was published. Advances have been made in all branches of the subject, but these have been most far reaching with respect to the structure of viruses and of their components, and in the understanding of how viral genomes are organized and how viruses replicate in cells. Significant developments have also occurred in the understanding of how viruses are transmitted by invertebrates and in the application of control measures for specific diseases. The taxonomy of viruses has advanced significantly, and there are now 25 internationally approved families and groups of plant viruses. All these developments have required that most sections be entirely rewritten. This book is intended primarily for graduate students in plant pathology, plant virology, general virology, and microbiology, and for teachers and research workers in these fields. It should also prove useful to some people in related disciplines—molecular biologists, biochemists, plant physiologists, and entomologists.